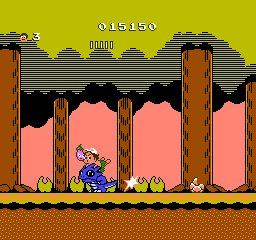 The original Adventure Island — though a fun little platformer in its own right — is most fondly remembered today for being a strikingly comprehensive clone of SEGA's Wonder Boy, as a result of developer Escape licensing the property (minus SEGA's character designs) to Hudson Soft for an NES port. Adventure Island swapped Wonder Boy's protagonist Tom-Tom for a shirtless, hula-skirt-wearing Hudson executive (Takahashi Meijin, though he's known as Master Higgins in the overseas releases); the rest, as they say, is history. The two brands have evolved in very different directions ever since, with Wonder Boy's work culminating in the sublime Monster World IV, and Adventure Island seeing ports, sequels, and spin-offs on systems from the Game Boy to the Wii. This first sequel, Adventure Island II, is where Hudson Soft's take on the series really came into its own, and with its cheery presentation, fun mechanics, and portable-friendly level design, it's a classic well worth playing for platform fans today. The adventure begins when the rather unfortunately-named Evil Witch Doctor kidnaps Princess Leilani's little sister, Tina, and it's up to pudgy Master Higgins, in his baseball cap and grass skirt — an unlikely hero even by Italian plumber standards — to save the day. For players, this translates into a distinctly prehistoric platforming romp across eight different islands, each with a different theme and around seven levels apiece. 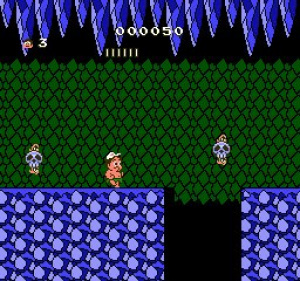 In spite of — or perhaps because of — its origins, Adventure Island has always done things a bit differently as a series, and there are quite a few mechanics that set Adventure Island II apart from similar-sounding platformers. For starters, Higgins is a hungry hero, and a vitality bar starts ticking down as soon as you begin a level. Collecting the fruit scattered about the stage will help keep it topped off, while waiting around, tripping over rocks, or getting slapped with the traditional eight-bit eggplant curse will drain it — and if it runs out completely, you'll lose a life. Like an appetite-based version of Super Mario Bros' level timers, the vitality bar keeps you moving through stages at a quick clip, and balancing speed and sustenance through a 'best-line' of running, jumping, and fruit picking is immensely satisfying. Though it might look like a traditional hop-and-bop affair at first, meanwhile, any contact with enemies will end your run even faster than an empty stomach — Master Higgins prefers to hop and hatchet, attacking his foes from afar by tossing an unlimited supply of stone axes. His grass skirt apparently doesn't have enough room to carry around that arsenal, however, so you'll start unarmed by default, and have to pick up the power-up from an egg before you can dish out any damage. Axes aren't the only thing hidden in Adventure Island II's eggs, either; cracking open the islands' ubiquitous, ovoid container of choice can also net you a helping hand from the game's rad ride-on roster: a skateboard (complete with helmet - safety first!) and four different dinosaurs. The skateboard sends Higgins on a high-speed dash through the level, with no way to stop but plenty of style to make up for it, and the dinosaurs each have their own special ability: the red camptosaurus spits fire, the blue camptosaurus attacks with tail-whipped sparks, the purple plesiosaur is at home underwater, and the mighty pterodactyl lets you soar through stages while dropping boulders on the baddies below. Riding on dinosaurs is as much fun as it sounds, and flinging axes while whizzing along on a skateboard is equally exhilarating — these power-ups give the game a ton of personality, and they're so generously distributed that as long as you're careful, you can spend most of the game on a Mesozoic mount. Each of these ride-ons also grants Higgins an extra hit-point, which comes in handy, particularly in the trickier later levels. The dinosaurs will stick with you between stages — provided you don't get hit — but even better, finding a new fossil friend while you're already riding one will send the first dino into reserve. Dinosaurs (and axes) you've collected in excess are saved between stages, and an item-select screen lets you outfit yourself with whichever of them you'd like to use before each level. The individual stages on each island are short — sometimes thirty seconds short — and very straightforward, though there are some well-kept secrets to be found, including hidden eggs, out-of-the-way rooms, and level warps. A boss encounter awaits at the end of each island, and they're all unique and exciting, with most playing out more like shoot-'em-up fights than hop-and-bop Bowser-battles. The bite-sized level design is a perfect fit for the gameplay; since the vitality meter essentially turns every stage into a speedrun, it makes sense that they're structured more like sprints than marathons, and the relatively simple platforming keeps the focus on axe-tossing, dino-riding, and enemy-avoiding, rather than plodding, pinpoint precision. 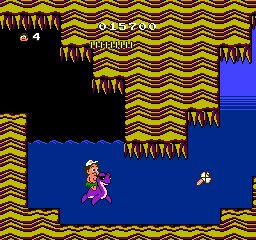 And while it lacks the finesse of the finest platformers, Adventure Island II still controls very well — a bit floatier than Mario, perhaps, but perfectly manageable. It's also aged more gracefully than its prehistoric theme might indicate — and better than many of its more technically impressive eight-bit peers. The graphics are crisp and clean, with solid colours and strong outlines that give the game a timeless, Saturday-morning cartoon feel. The sprites are sparsely animated but completely endearing: most of the enemies are inexplicably evil but still-adorable animals, and even Higgins himself can be appealing — especially in his wide-smiling skateboarding form. There's plenty of variety in the level backdrops as well; though they start to palette-swap after a while, you'll never see the same theme twice in a row, which helps keep things interesting throughout the island hopping. The soundtrack is a wonderful accompaniment to both the gameplay and graphics, endlessly upbeat and impressively varied, with breezy island tunes, catchy chiptune calypso, twinkling ice themes, creepy cave melodies and bouncy bonus stage music all adding to the adventure. The NES library certainly isn't short on side-scrolling classics, but even among such celebrated company, Adventure Island II stands out as a polished, prehistoric platformer with a sunny presentation and fun, fresh ideas. The compact levels are perfect for portable play, rideable dinosaurs add variety and personality, and the whole experience is wrapped up in brightly-coloured cartoon charm. If you're looking for a retro adventure with a feel of its own, you won't go wrong island-hopping with Higgins. "as a result of developer Escape licensing the property (minus SEGA's character designs) to Hudson Soft for an NES port"
Westone and SEGA did license the whole thing, it was Hudson who decided to change the characters around in most of their Wonder Boy conversions, according to the series' creator. In Mexico we called that game "El Capulinita" because in the first game Master Higgins looks like a very famous Mexican comedian! A good game indeed. Let's hope for AI 3 to be released. I remember renting this game as a kid, never really enjoyed it much though. Such a good game. 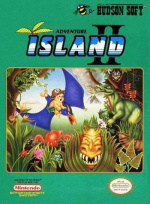 Also Adventure Island 3 and 4 too. Seeing this review makes me want to try the game! Looks like fun! One of my favorite platformers! This series is awesome. Nice series. Capulinita, in Mexico. About time this game gets released in NA for any of the Virtual Consoles. Hopefully it comes to the Wii U soon. I only played the Game Boy version of this game which dropped the II in the title and was simply known as Adventure Island. I'm not really big on the series, but I thought it was decent and the better game I've played from the series, and the most fun I've had from the hookmouthed caveman's adventures. 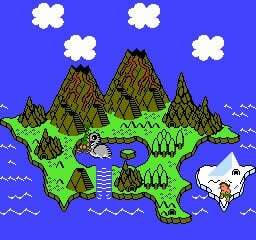 IMO it's better than the first NES Adventure Island and a thousand times better than the incredibly bland, unimaginatively average Super Adventure Island on the SNES; the addition of the dinosaur helpers was a really nice touch, and the areas looked rather nice and I liked its theme. @Aquilalex Haha, that's awesome! It really does look like him! Might get it. Have the Gameboy one on VC and it was alright. @zipmon Thanks for the review! Gonna get wonder boy 3 dragons trap on the sms or turbo grafx instead .ive heard mixed opinion on the turbografx version so ill probably get the sms version. See, great games age well. It's not about having the most cutting edge graphics or deep stories or cinematic cut scenes. Nice clean graphics, that are based on just decent art rather than tech, and good solid controls and general gameplay will always stand the test of time. I'm a massive Wonderboy fan, so I'll take this and Shantae when it comes out. @unrandomsam Some of the later levels are quite difficult, especially if you don't have power-ups to help. Definitely worth picking up if you don't have it already! Fun game indeed, it deserve the score. Same here. Never finished it though! not that it was hard or anything, quite the opposite actually. When i was a kid i spent more time drawing & coloring the Box Art of the first two games than actually playing them. 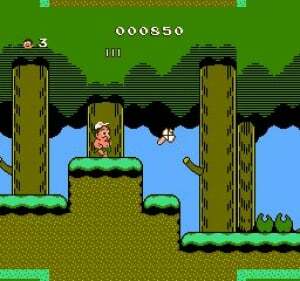 The first Adventure Island was far too difficult for any child to complete, let alone an adult haha. Yet I managed to finish it a few years or so ago on the Wii's VC. another sweet NES-victory! No easy task, and quite possibly the toughest NES platformer i've ever played. Even besting Castlevania III: Dracula's Curse and Ninja Gaiden III: The Ancient Ship of doom. @WiiULoveGBA You got it! Thanks for reading!